While other restaurants are busy promoting their culinary skills through week-long food festivals, the executive chef of the The Leela Palace invites you to enjoy the expertise of two Mexican chefs, for one day only. Marcela Castello and Veronica Rodriquez, from Monterrey and Mexico City respectively, will be adding dishes like Pork in Adobo and frijoles refritos (refried beans) to the brunch at Spectra this Sunday. a�?My friends from Mexico were here so I requested them to participate in our promotion,a�? says executive chef Dharmen Makwana, adding that theya��ve brought down Poblano chillies, Mexican cornflour, Chile Ancho, Chile Guajillo and Chiptoles for the brunch. a�?The hot buffet line will be all Mexican cuisine. There will be a carving station and a tostada stations, seafood ceviche, Mexican breads, live churros station and pan de muerto with vanilla ice cream,a�? he promises. a�?We dona��t cook spicy, we cook hot. We love salsas and use different kinds of chillies. Also, Mexican food is not only burritos and tacos,a�? says Rodriquez, who is already in love with our masala dosa and lamb biryani. She says one should not leave without trying the enchiladas, choriqueso (chorizo and cheese) and pork in adobo, while Castello says, a�?You should try all!a�? Castello has been living in Chennai for over two years now and enjoys our rasam and vegetable biryani. 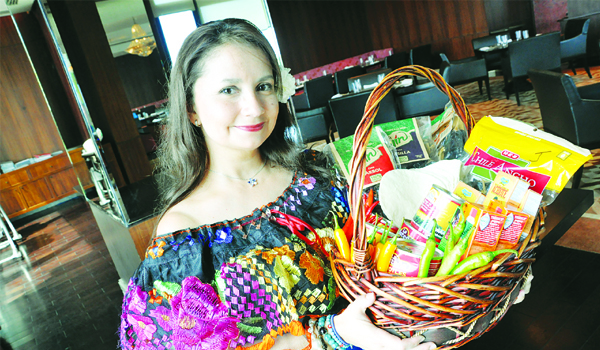 She promises a lot of traditional Mexican dishes this Sunday. But given ita��s a brunch, one cana��t frown that there will also be a bit of Asian, Japanese and Indian food on offer.